I picked up a copy of Kevin Cramer’s Universe Point and was prepared to not like the book. It looked like just another one of a number of ultimate-related books to hit the market in the past six months and I was fully expecting it to be, well, amateurish. I mean, really, Universe Point? Isn’t that just an over-used ultimate-related name to slap onto a book? And clocking in at a bit under 500 pages, i was even less excited to dive into it, knowing that it could be a slog I wasn’t prepared to push through. I was wrong. Cramer is an excellent writer, effortlessly describing times and places that will be familiar to almost any ultimate player. He weaves straight-up narrative with silly asides, alternating between intense showdowns on the field with unchecked revelry off. The book is essentially a memoir of his life as it revolved around discovering and playing ultimate, from a small college in Florida to summer league in Pittsburgh to graduate school in California and eventually to (almost) the AUDL. Cramer is someone that almost every ultimate player knows. He’s not the star, he’s not the guy on the highlight video — he’s just a player. And that makes him akin to the majority of ultimate players out there—the ones who will never play at Nationals or maybe even Regionals. The ones who love ultimate but don’t push themselves to that next level, don’t have the drive to participate in more than pickup or league play, or don’t live in an area where there’s any access to a good team. There are a lot of types of ultimate players that are ubiquitous—the player who played with the greats back in the day, the player who takes 45 minutes to warm up and is ready to play when everyone else is done, the player who wears the same shirt at every practice… Kevin is the guy who always gets hurt. His ultimate career was practically defined by the injuries that altered both his career and personal paths, but every time he came back to play more. This book made me smile and brought back a lot of memories of road trips, tournaments, parties, and friends, all attained through this great culture of ultimate that we all share. 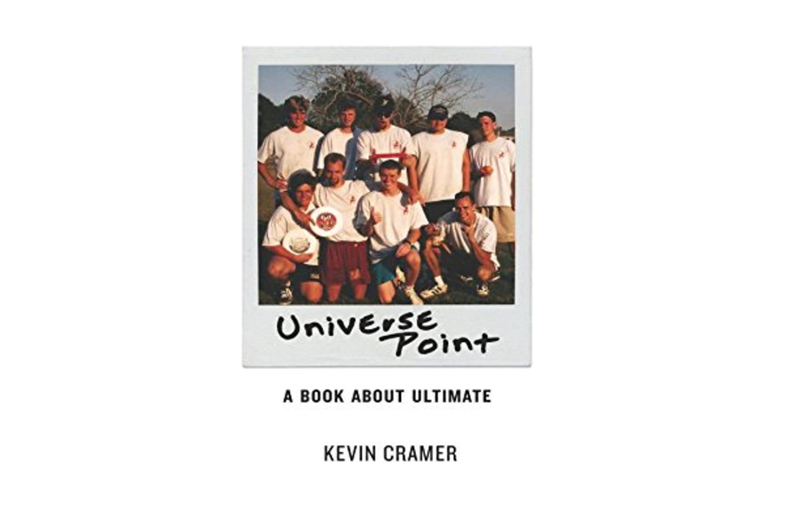 And I was forced to accept that, yes, Universe Point was indeed an appropriate title, as the near-unbelievable volume of universe-point games that Kevin participated in are described in all of their tense glory within the pages. I can only remember two universe point games that I’ve ever played in: one where we lost, one where we won. I’m sure there must be more, but even if I could dredge up a half-dozen more, Kevin’s got me beat. If you’re an old Grand Masters player like me, Universe Point will bring you back to your glory days of ultimate. If you’re a newcomer to this great sport, well, take a read and see how your Dad played and partied all those years ago. A lot of things in ultimate have changed in the past few decades—some things never will. Support Kevin and his writing—buy his book! Adam Ford has been playing ultimate since he was 15 and has played in at least one tournament a year for the past 25 years. He is a Head Observer at tournaments in New England and lives in Vermont. Comments on "A Review Of Kevin Cramer’s ‘Universe Point’"